Islamic Research Institute (IRI), in collaboration with Higher Education Commission (HEC) organized a national conference on “the role of universities in advancing national narrative to counter violence, extremism and terrorism” at Faisal Masjid campus of the IIUI. As many as 80 Vice Chancellors of the universities have shown solidarity with the armed forces and Government of Pakistan for countering extremism and radicalization in a grand muster organized by International Islamic University, Islamabad (IIUI) on Monday, Nov. 20, 2017. The joint declaration was announced in the concluding ceremony in which participants called upon inclusion of ethics, societal values and ethics of disagreement as part of the curriculum. The participants maintained that sectarian hatred and imposing ones ideology is clear violation of Shariah and it cannot be allowed as it is against the constitution of Pakistan. It was declared that Pakistan can never be used for the propagation of any kind of negative activities such as hatred, training of terrorists and other ulterior motives. The joint declaration said that a subject of interfaith harmony, tolerance and peaceful coexistence will be introduced in all the schools. The VCs and ministers agreed that non Muslims must be provided full protection of life and higher education institutions would discourage discriminatory attitudes in this regard. The declaration also discussed that university community will ensure that no outlawed organizations be allowed to use their facilities including online platforms for promoting agendas of hate and extremism. 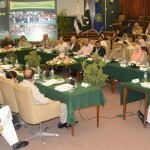 It added that monitoring and counseling should become a regular activity in the universities. 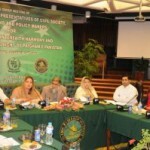 The participants also recommended that directorate of students services should also be established in the universities. The gathering was of the view that it was imperative to engage youth in useful academic and social activities that promote professionalism, ethical conduct and tolerance. The participants also said that the aspect of freedom of speech be observed and juristic and ideological discussions must be taken in educational institutions instead of inappropriate places and ethics of disagreement shall be made part of the curriculum. They agreed to remain united and committed to curb hatred, extremism and violence. Hafiz Abdul Kareem, Minister for communication said that education was the backbone for prosperity and progress. In the concluding ceremony, he added that Pakistan has played a pivotal role in war against terror. He furthered that universities are the best sources to eradicate the menace of extremism. Mumtaz Ahmed Tarar, Minister for Human Rights called for discouraging violence saying that no religion in the world supports extremism and violence. He maintained that Islam was staunch supporter of peace and prosperity. He stressed that youth be put in the constructive activities to have positive results in the society. Senator Mushahid Hussain Syed, in a session, called upon a cohesive and well devised strategy and counter narrative against extremism which he said was impossible to be implemented and established without bridging a gap between academia and parliament. He said that VCs and legislators together can serve way better to produce a counter narrative and have the educational institutions empowered. Dr. Mukhtar Ahmed, Chairman HEC, said on the occasion that society is being poisoned by the negative elements with the seed of hatred and it is facing the challenges of intolerance and extremism. He added that lethal attempts of instability can be foiled through unity and by an active role of universities in the society. He stressed upon the universities to teach societal values and message of peace to the students. He also hailed armed forces while saying that they have played a historical role in eradication of extremism. Dr. Masoom Yasinzai said that extremism was the menace which has crippled the society and a counter narrative to deal with it was a pre-requisite for progress and prosperity. He called upon the universities to take the responsibility to nurture youth and address the issues of hour. He also briefed the participants regarding the activities and efforts initiated by the IIUI to curb the problem of terrorism, violence and intolerance. 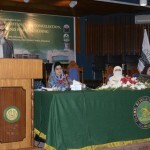 IIUI President Dr. Ahmed Yousif Al-Draiweesh said that university had organized around 400 conferences, seminars and dialogues regarding eradication of extremism, violence and promotion of peaceful co-existence which were attended by scholars, academicians, intellectuals of Pakistan and aboard. 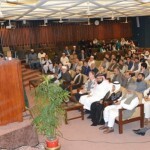 He urged universities to make dissemination of peace their top priority. He also apprised about the constituent units and faculties of the university. Earlier, Director General IRI, Dr. Muhammad Zia ul Haq apprised the participants regarding the efforts of institute for counter narrative. 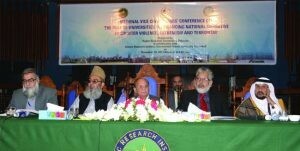 The conference was also attended by the IIUI Vice Presidents and other relevant officials.